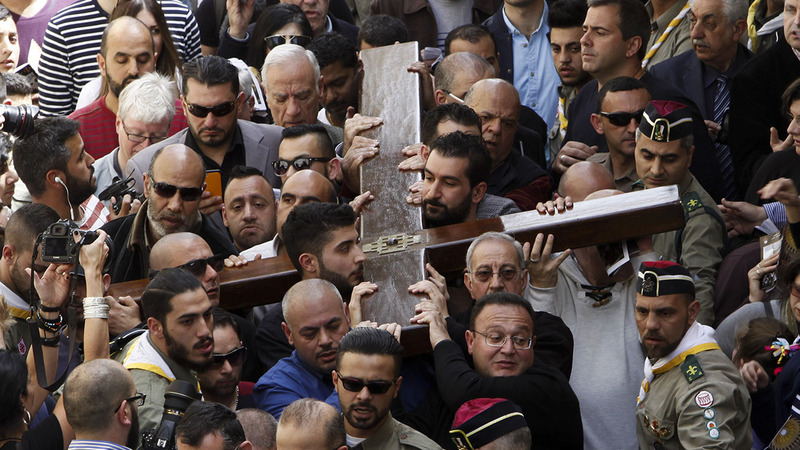 FILE - Thousands trace Jesus' footsteps on Good Friday in Jerusalem. Good Friday commemorates the Crucifixion of Jesus Christ in Christian churches. HOUSTON, Texas (KTRK) -- In Houston, there are a number of Easter services and masses planned for those who would like to observe the Holy Week. Conclusion of the traveling Way of the Cross from University of St. Thomas - 1 p.m.
Saturday Easter Vigil: Mass in English at 8:30 p.m.
Easter Sunday: Sunrise Service- 7:30 a.m., Traditional Worship- 8:45 a.m., Sunday School- 10 a.m., Contemporary Worship- 11:15 a.m.
Saturday Easter Vigil: Mass in English at 8 p.m.
Saturday Easter Vigil: Mass in English and Spanish (Bilingual) at 8 p.m.
Beginning at 10:15 a.m., women and men, priests and hundreds of lay people attend this pilgrimage through Houston's Montrose, Midtown and Downtown neighborhoods. Sponsored by UST Campus Ministry and Houston's Communion and Liberation lay movement community. Ending at the Co-Cathedral of the Sacred Heart, 1111 St. Joseph Parkway, Houston 77002, welcomed by Archbishop Emeritus Joseph A. Fiorenza at around 1:30 p.m.
5 p.m. - Thirty parishioners will lead hundreds through their re-enactment of the Way of the Cross. 9 a.m. - Parishioners complete a dramatic image using 25 carpets made with colored salt and decorated with religious designs. 5 p.m. - More than 400 people will process over the carpets and follow a live re-enactment of the Stations of the Cross. In a symbolic gesture, the carpets are destroyed in the procession. This primarily Central American tradition was introduced to Holy Ghost Catholic Church by parishioners. 4 p.m. - One thousand parishioners attend the live re-enactment in the neighboring parochial school field, followed by Veneration of the Cross inside the church. 2 p.m. - In probably the largest procession in the Archdiocese, approximately 2,000 people will follow a live re-enactment of Christ's Stations of the Cross. 12 p.m. - Starting at 6 a.m., parishioners can pray and meditate in silence before the cross. Then at noon, a live re-enactment of Christ's Stations of the Cross takes place inside the church, with 700-800 expected to attend. 2 p.m. - The Spanish-speaking young adult group will lead a live open air dramatization of the Passion of Christ. Approximately 1,000 people are expected to attend.